The Through-beam safety light barrier SLS 78/R is an active optoelectronic protective device (AOPD) type 4 according to EN-/IEC 61496-1, -2. It consists of transmitter and receiver. The Type 4 light barrier, like the ROBUST Multiple Light Beam Safety Device System, is designed for operation under unfavourable environmental conditions. 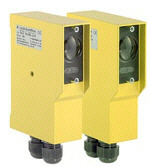 Range from 0 to 60 m.
Integrated lens contamination monitoring via sensor status indication (LED). Integrated lens heating system for outside use or use in extreme environmental conditions. Glass optics – high mechanical and chemical resistance. Easy to mount with Plug-in Terminals without screws. Ready-to-plug-in version available on request. Purchase your Leuze SLS 78/R Through-beam Safety Light Barriers today!